At Cliff Avenue Upholstery and Restoration, we take pride in our ability to handle virtually every aspect of restoration and upholstery you need, in both a timely and flawless manner. Our staff includes some of the area’s best in the business, and our services range from complete restoration to professional design to carpet replacement and everything in between! No matter the size and scope of the job, Cliff Avenue Upholstery and Restoration have you covered! We do everything, from show-winning concourse restorations to repairing vehicles after an accident. In addition to working with individual clients, we also work with dealerships as well! Our process is all completed in-house, ensuring for quality control and limiting outsourcing costs. At Cliff Avenue Upholstery and Restoration, if you can dream it, we can do it! Our paint jobs out shine all the rest... if you want that straight, stunning look as you look down the side of your vehicle, that's what you will get from us! Buffing out your existing paint can remove most surface scratches and is a great way to bring your paint back to life while making a dramatic difference to the look of your vehicle. We replace rusty metal, without the use of Bondo or mesh. We can paint virtually every type of vehicle, from fully restored show cars to low cost driver vehicles. Whether you need a complete rebuild of your engine, a brand new crate motor, or just need to update a few things, Cliff Avenue Upholstery and Restoration has your engine needs covered! If your engine already runs great, we can detail it out and make it look bright and new again. 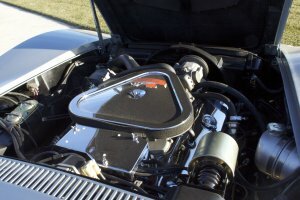 Car fanatics know that the core of a great vehicle is a great engine, and with Cliff Avenue's engine service expertise, you'll get results that will impress anyone looking under the hood! We can replace your old brake lines with new stainless lines as well as redo your suspension for a much safer and smoother ride. If your rear-end needs a tune-up we can rebuild and detail that also for you. If its custom exhaust and headers you need, Cliff Avenue can give you something unique that's guaranteed to draw attention. 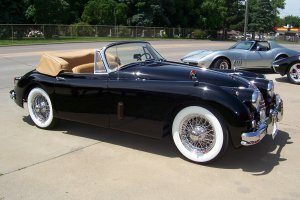 When updating or trying to recreate classic cars, many people adhere to the exact specifications of the original. At Cliff Avenue Upholstery and Restoration, we can recreate your classis vehicle or fabricate something completely custom to fit your needs! If you can imagine it, Cliff Avenue can build it. Just let us know if you need something out of the ordinary, and we will fabricate a custom job for you. As the main ingredient of any car, metal provides the basis and support for your vehicle. We can re-chrome bumpers or any other piece with high quality chrome plating that is an important part of the overall look of your vehicle. In addition, we can provide zinc plating to your old rusty bolts, nuts, hood hinges, locks and more! This makes even the oldest parts look brand new again. We also offer a stainless steel polishing service to repair, buff and polish your old stainless trim pieces. Cliff Ave uses the experts at Advanced Custom Chrome on our projects, ensuring the highest quality. Check them out at Advanced Custom Chrome. With car restoration, it's all about the details. 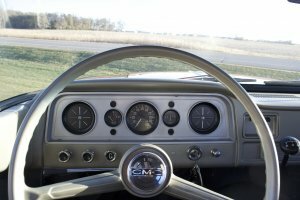 We can update the finishing touches of your restored car, working on everything from specialty tires/wheels to custom gauges to steering wheel restoration! We also can replace old wiring and old harnesses to provide safety from a potential fire hazard. At Cliff Avenue Upholstery and Restoration, we have the knowledge of classic vehicles to know how to restore each detailed part, and the ability to get the job done. Cliff Avenue Upholstery and Restoration has established lasting relationships with some of the car restoration business' top-name distributors. We are a licensed Danchuk dealer, allowing us the ability to supply almost any part for your ‚ '55-'57 Chevrolet. We are a licensed Vintage Air dealer, allowing us the ability to provide and/or install an air conditioning unit designed for your classic car. We are a licensed Street & Performance dealer, which allowing us the ability to provide and/or install literally thousands of performance parts for your classic car and engines. If you have a classic or custom restoration in mind, it's usually best to be able to see it on paper first. 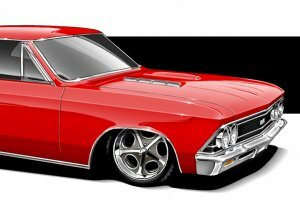 Cliff Avenue works with Eric Brockmeyer to provide a professional drawing of that "dream car" that is in your head before ever working on the physical version. This allows the client to see a beautifully colored and proportionally accurate version of their vehicle to ensure it fits each of their requested needs. Check out some of Eric's past drawings on our Gallery page to see for yourself why Eric has built a reputation as one of the best in his business! Our seat services include being able to update or replace virtually any part of a seat on any type of vehicle! We work on frames, cushions, torn upholstery and more to update your vehicle. South Dakota winters are cold, and we can even install heated seats for your vehicle! In addition, we even have lumbar supports, medical foam and gel packs to improve overall comfort as needed! We can also work on any upholstery need you may have for an airplane, boat, RV, ATV, snowmobile and more! In addition to being able to handle all of your car upholstery needs, we can also provide a variety of upholstery services for boats, tractors, snowmobiles, ATVs and more! If you have upholstery that needs work, Cliff Avenue has a solution! We can also repair and replace boat tarps or any other upholstery product for your toys. We can change your old fabric seats into leather, or just replace your existing worn out leather seats with new seat kits for the whole vehicle. At Cliff Avenue Upholstery and Restoration, we have the resources to find the original fabrics, vinyls, door panels and more for your old car! We offer carpet replacement services if you just can't get your carpet clean anymore or if it's worn out. If you headliner is hanging down, we can replace that as well to make it new again! We can do everything from updating a part or two of your vehicle's interior to replacing the entire interior, as well as being able to make-up any custom design provided to us for a one-of-a-kind look. We can replace all convertible tops and/or rear windows on convertibles. We can just do adjustments and replace old worn out top cylinders also. We can remove and replace the old vinyl top on your car to make it look like new again, or change the color to give your car a new look.